It's time for yet another rant - this time about the NHS or the Minister for Health or whatever skinflint is in charge of the NHS purse strings. 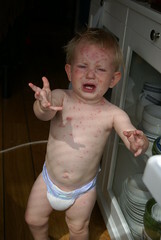 I am slowly coming to the conclusion with child number three that it is more than scandalous that there is a cheap, effective vaccine for chicken pox that from my trawling of the internet is the norm in the USA but we are still putting our precious little people through this unnecessary nightmare. When Marcel and Charlotte got chicken pox back in 2002, they both got really mild doses. That is to say they had a couple of dozen spots and a temperature for 1 day. Charlotte being an exceptional child decided to catch the uncatchable a second time in February 2005 causing me untold problems: blood tests etc as it is dangerous to pregnant women who haven't had it and of course I was 5 weeks pregnant with Léon and no one could remember me having had it - more hassles. Again though Charlotte had a mild dose - perhaps as few as 10 spots and no temperature, so I wasn't overly concerned from a health point of view - simply from the hassle point of view that when you only get 5 weeks holiday a year you really don't want to be taking 10 days off each time a kid gets chicken pox. Léon though, if you have been following my poxy saga, has changed my view of the need for vaccination. 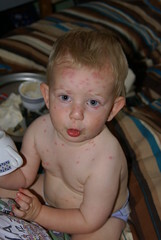 Léon got one of the worst doses of chicken pox I have ever seen. (Maybe because he is so young, I am not sure). 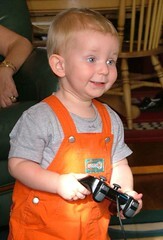 He was unwell and had to be off nursery 4 May through 15 May. He had a temperature, he couldn't sleep, he couldn't eat, he was up every hour for days and nights on end. I had the hassle value of arranging places and people to look after him, the hassle of working from home 3 days making sure I fitted in my 4.5 hours of work sometimes by working long after everyone was asleep in bed. I was stressed, tired, no exhausted and I was also worried sick about a really ill wee man. After only one day back at nursery, he started vomiting profusely and was sent home again. I too was on the verge of illness by now after 2 weeks of this level of stress. Two days after the vomiting started he was burning up and the emergency GP appointment diagnosed an ear infection in each ear and a chest infection all caused by the fall out from the chicken pox and what it had done to his immune system. He got antibiotics and was finally starting to eat and smile again by last Tuesday. Of course when the antibiotics finished on Thursday night the inevitable happened - Friday he was ok, by Saturday his nose was running and today he was roasting, not eating, pointing at his ears and wailing. A 24 hour trip to the hospital diagnosed 2 ear infections and a throat infection - all further complications of the bloody pox. How long is this wee man going to have to suffer - all for a vaccine that would probably have cost tax payers 50p? He's been ill for the best part of a month, can hardly stand, I am shelling out £350 for a nursery place he is never well enough to attend and I am stressed out my mind trying to work at 3am so I don't lose my job. It's truly wonderful our NHS - isn't it? Barbra, as I mentioned last month, is coming to Europe for the first time in 13 years. And when does she choose to come - right in the middle of my bloody (unchangeable- because-of-a-wedding) summer holidays. So I'm left with about 3 of the dates that I am actually available for. I check flight prices and decide since it is equally expensive to go to London or Rome, I might as well pop off to Rome. I go online and actually manage to get tickets, great - result! So I book flights to go to Rome for a weekend - Ryanair of course - cheap and non-refundable but why would I need it refunded...unless the useless, arrogant, idiotic promoters pull out of the Rome date, thinking they can easily just swap 15 June Rome for 18 June in Zuerich at 2 weeks notice without causing anyone any inconvenience...What are they thinking about? Ok this will slightly upset 200 Italian fans but what they fail to realize is that with Ryanair being fairly reasonable in price, half the tickets will have been snapped up by people who are going to be flying in from all over. She isn't going to every country so this is going to piss off a hell of a lot of people. I have just zapped off an email to 'CPI' asking where I apply for my flight and hotel refund and when they will forward me tickets at the same price for her London concert...I will keep you posted with the no doubt unsatisfactory answer I receive! (Oh and apparently it is going to take them 20 days to process my refund - by which time I will no doubt be too late to spend it on any other venues - they are going to become more than fed up with me in the near future - believe me. Léon, as you know, has been very unwell - 10 days of really bad chicken pox complete with pox in his mouth and throat etc making eating a painful trial. Thereafter, with a much weakened immune system, he caught a vomiting bug for the best part of a week, not to mention a seriously high temperature caused by both a chest and ear infection. All this meant he spent nearly 3 weeks eating very little other than a yogurt a day. On Tuesday this week however, with the pox almost gone, the sickie bug at bay and the antibiotics kicking in, he discovered eating was once again a possibility. And he got down to serious, making-up-for-lost-time eating, serious better-eat-today-in-case-I'm-ever-ill-again eating. He tends to go to his high chair approximately once an hour and stick his hands up to be lifted in. If that is ignored for more than 5 minutes, he opens the Welsh dresser, takes out a plastic plate (even tugging on one if 10 china ones are balanced on top - we've had very few breakages so far) puts it on his tray and sticks his hands up again. So we've been feeding him a little more than usual to build him up a little. Today was a prime example. Before work he asked for a yogurt, a digestive biscuit and a piece of banana. At 8-15 he had a bowl of weetabix at nursery, at 9-30 he apparently downed a plate of breadsticks, a box of raisins and a biscuit, at 11 a piece of toast and cheese, at 12 he had a bowl of soup with a roll, a bowl of chili con carne and then had the cheek to hold out his bowl to be refilled. He ate a second full of bowl of chili before his juice and fruit and at 12-45 when I arrived he was in the toy kitchen trying to put plastic pieces of toast into a toy toaster... a hint? I drove him at 1-30 to mum's where (as you can see here) he managed a plate of bacon followed by a packet of dolly mixtures and a chocolate biscuit - something he's only been allowed once or twice before. Tonight he's with André - I wonder how much he's conned him into feeding him!? I did hear today about a snake that exploded trying to swallow an alligator...I wonder if a baby has ever exploded? My dad, aka Victor Meldrew himself, has the cheek to blog that I'm a ranter! My God, has he reread his own stuff! ;-) Rant rant rant! It isn't often I comment on adverts - I usually find them mind numbing or annoying but I have to say if I needed a smaller car than the one I bought last week, I might just have considered the Skoda Fabia because its advert is so sweet. I hadn't noticed it till yesterday when the kids shouted me through to watch it - both announcing they'd like to try a piece! Well done Skoda for making a car ad, unlike any others. As promised, here is a photo of my new baby! Isn't this cheerier than a cloud-coloured car? For anyone who is interested, it is the beautiful Citroën C8. I will let you know more about it later in the week as it has so many buttons and knobs, I haven't quite worked out what it can do yet! (There are a few other photos on my flickr page too, if you want to see them). So inspired by Thomas' latest photographic achievement, Lots has finally blogged her next chapter. WHY MAKE THE DREARY DREARIER? Originally uploaded by Pete Ashton. I decided last week after my car's little gearbox problem, that the time had come to buy a new one. Sure it isn't that old at 5, but I'd rather have something I don't need to repair from time to time, buy new tyres for etc. I decided I would prefer a 7-seater this time as I often need to take my 3 kids plus say my parents to the shops or for a day out, which is just much less hassle when I don't then have to force them to bring one of their own cars along. So on to the internet I went to surf myself a nice new people carrier. 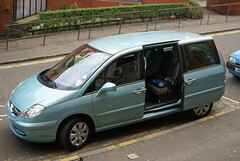 I tried the obvious in Scotland - that is to say Arnold Clark, and he had a wonderful selection of 1 year old 7 seaters, all makes - the Seat Alhambra, Peugeot 807, Ford Galaxy, VW Sharan, Citroën C8, Renault Espace, Kia Sedona etcetc - you name it - dozens of them - great, but 90% of them were grey or silver. Scotland is often a grey, cloudy, dreary and depressing land where you feel you could catch a cloud just by reaching a few centimetres above your head. This isn't like Greece or Italy or the South of France where you are greeted every morning by brilliant blues, sunflower yellows, explosions of purple bougainvillea. We spend 80% of the year looking at grey. So why do we paint our houses grey and fill our roads with grey cars? Can't we have pink houses and yellow cars to make our life a little less dismal? Anyway as luck would have it, one of the best cars I found on sale at Arnold's with the lowest mileage and highest spec wasn't grey so I bought that. Call back in a few days if you want to see what colour I am trying to brighten the world up with! I've been using Vista now on my new laptop for a couple of months and it is really nice. It looks pretty, works well, the new office programs like WORD are lovely. I can't fault it...well except for one incompatibility that I find surprising to say the least. There seems to be one website Vista isn't too happy to let me in to - go on guess? WRONG! Hotmail, believe it or not! For the first few weeks it was fine but in the last 3 weeks, I get a login error approximately 40% of the time. So on those occasions, I am forced to log on to a second computer in the house, running either Windows XP or UBUNTU linux and read my mail from there - how ridiculous is that? Now am I being thick here, or is Vista a Microsoft product as is hotmail? If there was one web mail service I would expect to work on Vista without a hiccup - surely it should be hotmail, no? Anyway - if they don't fix it over the summer, I will seriously be considering dumping the email address I have had for the past 10 years in favour of a googlemail or yahoo equivalent. So Microsoft - GET IT FIXED NOW, please! Originally uploaded by Up Your Ego. I have to have a rant about disabled parking. I was in Tesco today. Thomas nipped out for some shopping and as neither I nor Pudge were feeling great, I waited with him in the car for 20 minutes. 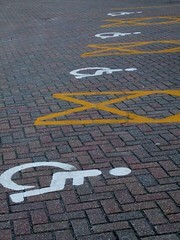 I happened to park opposite 10 disabled parking bays. I have a very special friend with a disabled child. She can't walk so her mother has to try to carry her from the car to a buggy and after shopping get her back into the car. That needs enough space around the car to open the doors, that needs the parking space to be near the entrance to the shop. Anyone who has tried carrying a sleeping 4 year old can just about imagine how awkward that would be if for some reason you couldn't get the doors open wide enough. I sat for 20 minutes becoming more and more infuriated with lazy, selfish people using these bays not as disabled parking but as I only need to get a few things parking. The first culprits - 2 twenty something females in jogging suits - jogged in quickly and returned 5 minutes later with 2 20 packs of beer, the next a father who zoomed in in a people carrier, left all the kids in the car and rushed in and bought one bag of stuff, again and again the pattern repeated itself till at one point all 10 bays were filled and not a single disabled badge was on display. Because they were rushing, everyone of the 10 had literally sprinted into the shop, no doubt feeling what they were doing wasn't a great crime as they'd be quick. Imagine for one minute my friend had arrived at that moment and could get her daughter out the car, had had to carry this large child to the entrance in the rain from a far corner of the carpark? I felt like getting out and punching them. I wish people would think before being so selfish. Originally uploaded by kimi & fer & flor. I have not had the least stressful week of my life. 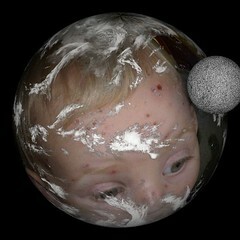 Léon (as you know) decided to get a lovely dose of chicken pox so I couldn't take him to nursery. I had a big report to write for work so I couldn't take a holiday. André is away on holiday so I had no one else who could babysit and could hardly ask any friends or relatives with kids. Also with André away,I had to be in several places at the one time - schoolrun on the south side of the city, babysitting in the middle of the city, work on the north side of the city. (When are they finally going to invent human cloning?) So I was stressed. I was trying to work from home, working from 8 or 9 till nearly midnight so I could care for a crying baby when he was awake. I was exhausted and stressed. 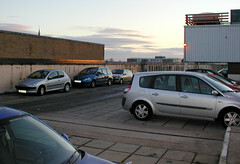 So why did the bloody car decide to play silly buggers? 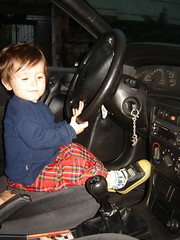 I drove the kids to school on Friday and it felt odd, the gears were a bit wobbly. After working I drove back and the engine growled and banged, the gears jumped into neutral, I tried to do a 3 point turn and the car refused to go into reverse. I burst into tears and may have uttered the 'F' word. I don't need a £500 bill for a new gearbox a month before the summer holiday. Waaaah - why is life so hard? I knew it had to be the clutch or the gearbox. Dad had a shot, and suggested we asked our mechanic friend Ian. He took it for a spin and confirmed something was going on. He stuck it up on a ramp and looked underneath and announced - the bolt the holds the gearbox in place has fallen out - it is a 2 minute, free repair job! RELIEEEEEEEF! Thanks Ian! I can definitely highly recommend 'Thornliebank Motor Engineers' to any stressed motorist. I had a very strange experience on Saturday night. Derek and Amanda were round for dinner and Thomas had cooked a lovely three course meal. As usual I was being a more or less teetotal bore - sticking to my half glass of wine and fruit juice. Derek had brought beer. I didn't bother with this because I have never liked beer - after all it's a bitter nasty drink, or is it? Derek let me taste this weird beer he'd bought - cherry beer to be exact - and it was lovely, Thomas then proceeded to take both peach and cassis beer out of his cupboard - both equally lovely - not only did I not mind these drinks but I actually liked them! I would go as far as to order them in a pub - wow - at the ripe old age of 39, I finally discover I like beer after all. How sad am I? Well he isn't a happy man today. He was up most of the night burning hot and only really happy when he was being held. When he cries you can see his lips, tongue and gums are covered in spots. He just can't understand what is happening to him. Poor wee man. I went to bed at midnight but was woken at about 1am with Charlotte crying - she had a sore stomach. I sat and hugged her on the couch for 15 minutes till Léon woke up screaming because of his chicken pox. So I packed Lots off to bed and went in to Léon. He was hot and clingy and itchy. He woke up again at 2ish and 3ish and 4ish and 5ish and 6ish and by 9am Thomas and I had aged 10 years each. Thank heavens today is a bank holiday because I'm definitely not fit to drive to work or think once I would get there. On Friday after nursery I noticed Léon had one tiny blister on his torso (see the note if you click on this photo). I said to Thomas immediately - Pudge has chicken pox. He thought I was quite mad, I think. I was more than surprised on Saturday morning when very little had developed but still thought my hunch had to be right. Saturday we'd to give him calpol twice as we was a wee bit hot. This morning it looks like my GP skills have been proved right though. He's laughing and singing but definitely not looking his prettiest today. I guess I now have to work out where to put him all week as nursery isn't going to welcome him with wide open arms! PEANUT ALLERGIES - A HOME-MADE PROBLEM? I read this article on the BBC today with interest. I have wondered for some time now whether we in the UK aren't actually causing this explosion of nut allergies we are seeing. I know several kids with severe nut allergies. Given I work with foreign languages and am known for it in Marcel and Charlotte's school community, I have lost count of the number of parents who have come to me over the years. The question is always the same - My kid has a life-threatening nut allergy, could you translate this into French/German/whatever so I can take it on holiday with me. Invariably the piece of paper I am handed says something along the lines: Can you cater for my child's nut allergy? Can you guarantee your products and kitchen surfaces haven't been touched by nuts? Almost always after the school break, the same parent rings me, thanking me profusely for the translation but saying that the restaurant in France, Italy or Germany has looked at them as if they were from another planet and given them, at best, a plate of pasta with a tinned tomato sauce. The reason being these countries don't seem to be suffering the same explosion of nut problems. 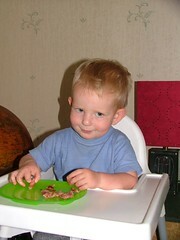 When I had Marcel I was told strictly to avoid all nut products throughout pregnancy, breastfeeding and until he was 3. I completely ignored this advice, ate my crunchy nut cornflakes, even when I was in labour and often as he suckled at the breast - why? Because I had eaten nuts all my life, all of my family had and I thought this was extremist scare-mongering. Marcel has no problems with nuts. I did the same with Charlotte - she doesn't like nuts but has no allergy either. Interestingly, while being given this terrifying advice by UK GPs, I was over showing Marcel off to the French family when he was 16 weeks old. I decided to buy the odd jar of baby food for him as it was too much hassle to home-cook on a 1 week trip. And what were they selling in the French supermarket (a country which struggles to understand the concept 'nut allergy' as very few have it?) Nut-flavoured baby food suitable from 4 months old, of course. It doesn't seem like rocket science to me. I will watch the outcome of the study with interest. It seemed like a good idea when I looked at the BBC Scotland Weather webpage. I guess the background is something very Scottish. When you are born in Scotland, you come to sense how transitory nice weather can be. I once knew a Californian guy who would get up on a Saturday morning (while living in Hyndland for 5 years) and see it was raining - he'd then declare he'd go shopping 'when the rain went off'! It doesn't work like that. 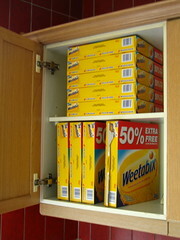 You could potentially starve to death if you limit your supermarket trip to the next dry day. Equally sunshine is something you don't overlook. If you get up and it is sunny you don't finish the ironing, or do the dishes before running outside. You run outside carrying your bowl of breakfast cereal with you because if you stop to finish it first, you might miss the only window of warmth and light for weeks. So there I was on Sunday morning looking at a weather forecast with a big yellow sun and 20 degrees. Not bad for April. Obviously, we had to go to the beach. We drove to Prestwick and walked to Somerfield to buy sausages. The kids did ask to put on a jumper, jacket and hood to go for that 5 minute walk because although the sun was shining there was just a little bit of a north wind blowing. We played some rounders on the beach, successfully while the disposable barbecue heated. We put on the bacon, sausage, and pork chops. I think the flimsy paper plates didn't really help either - you see when Marcel put his chop on the plate he was holding in one hand, it promptly folded in the middle leaving the beautifully cooked chop to fall on the sand. We'd no water, only coke so we couldn't clean it. Pudge was getting hungry and had a little cold. He wailed, the tears ran down his face, the snot joined in, the wind blew sand that stuck onto the tears and snot, the sand went in his eyes, he cried some more and rubbed his eyes with his now sandy hands. We tried to give him a sausage because he was hungry, the sand from his hands and face stuck to the sausage and he sat crying and crunching simultaneously. Yuck, yuck, yuck. I guess we learned a valuable lesson - barbecues are what you do in a garden, at least 50 miles from any sand, with no wind and when your kids aren't extremely hungry. Beaches are for building sand castles, collecting shells, playing sports, walking the dog if you have one but never ever ever for barbecuing sausages in the wind! Did you happen to see Annie Leibovitz's new portrait of Elizabeth II today? I really liked the photo. As I mentioned last week, (or was that on Thomas's blog?) I am fairly indifferent to the royal family - I tend to think they'd be better off if we were a republic because the poor buggers could lead a normal life, but I have no strong feelings about them either way in general. However, as a fan of some of Annie's photos - I particularly like the Whoopi Goldberg, the John Lennon (of course) and the stripy guy (who was he again?) so I took a look at the new Queen thing. I really like it. The sinister sky outside, the very regal Queen - I think she's captured something very timeless there. I don't know about anyone else but I will be glad once this Scottish election is done and dusted. In the old days we had 4 parties: Labour, Libdem, SNP and Tories and that was about it really - with a 'first past the post' system the weirdos tended to stay well tucked under their stones. Now, however, when they actually stand a chance, we are having to put up with all sorts of filth and madness being posted through our letterboxes from the Independent loonies standing for election on a single issue such as 'please don't have fortnightly refuse collections', to the highly objectionable BNP, whose policies I won't repeat, to the nutters who posted us a leaflet today - they seemed to be calling themselves the 'Scottish Christian Party' but if you read their leaflet they seemed to actually be the 'Scottish Homophobic party', campaigning on the main issue of making homosexual teenagers have to sit through lessons explaining to them what an abomination they are in God's eyes. Give me strength! Well I suppose it helps to know the spectrum of objectionable people we have to walk the face of this Earth with. Barbra is coming to Europe! She must have heard that I went to all that bother to visit her last year so she's coming to visit me instead this time, nice of her! Because of Miriam's wedding it looks like I am stuck with either London, Paris or Vienna, though more dates are still to be announced. I must admit, Paris tempts me much more than London, but anywhere's an option. See ya soon, Barb!